More lost working days in the UK are caused by manual handling injuries such as sprains and strains due to the incorrect lifting, moving, pushing and pulling of objects in the workplace than any other injury. This causes not only suffering to employees but also lost working hours for employers. This manual handling techniques course gives learners the basic knowledge and techniques to keep themselves safe when moving or handling objects in their workplace. This course also helps to raise awareness with accident statistics provided by the HSE (Health & Safety Executive). The Manual Handling Operations Regulations 1992 require employers to ensure that all employees are trained and competent in manual handling. It is the employer’s duty to avoid manual handling as far as is reasonably practicable and, if this cannot be done, the employer must take steps to reduce the risk of injury. This course will reduce that risk for you. The Regulations do not set any weight limits for lifting and carrying loads and amendments in 2002 now require employees to have adequate or appropriate knowledge or training in order to make assessments to judge whether safe moving is possible. The regulations apply to almost all work environments from offices to care homes and factories. There are different risks associated with different sectors and this accredited qualification offers learning outcomes which are suitable for all. Kent Forklift Training can deliver courses at either your workplace or at one of our training centres. The course incorporates moving or lifting objects alone, within a team or by using lifting aids. Correct manual handling training will reduce the risk of accidents occurring by identifying and preventing them. 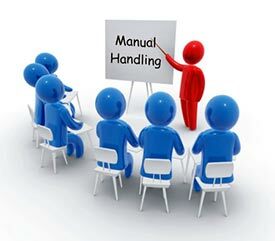 Manual handling is not difficult to learn but can save a lot of problems for employers and employees.